Planning parties can be confusing and frustrating: the best party requires attention to detail and a knack for organizing and multi-tasking. Not everyone is the best multi-tasker, but luckily this template is so simple and easy to use that anyone can become the next life of the party! 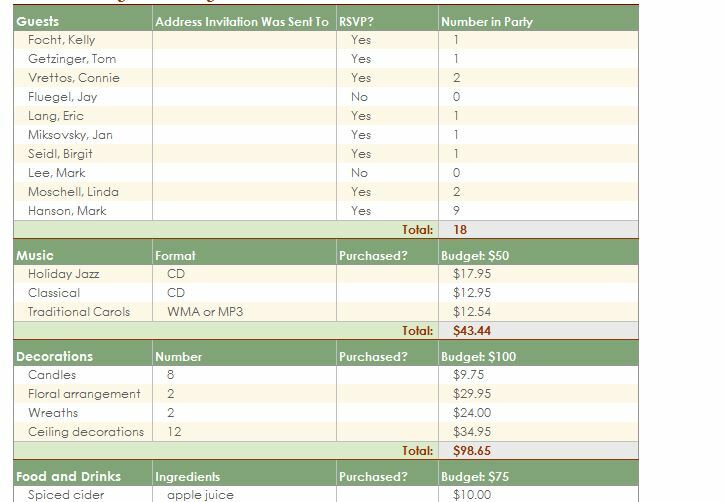 This Excel party planning template is the perfect tool for organizing and budgeting your next bash, from decorations, music, guest list, presents, scheduling and more. The Microsoft party planning template is absolutely free and available for download conveniently on our page, at no cost to you. The template is easily customizable in Microsoft Excel. Do not worry – you do not need to be an Excel expert to use this template. The planning template is absolutely easy to use and is right here for download on our page. Why stress out about your next big party when you can use the convenient planning template to make sure you are ready for a memorable time with friends, co-workers or family? The Party Planning Template can help you with all aspects of your next party. Here is an easy step by step guide with advice on how to utilize the party planning template’s many useful features. Do you need music or decorations? Keep an organized list of your party supplies and make sure they fit your budget. Your completed template can work as a convenient shopping list. If you have a long list of presents or gifts, enter them into the party planning template to keep them organized and to compare your net present value to your current budget. Create mini-budgets for each aspect of your party: food, gifts, music, etc. By entering these separate budgets, you can compare your various party budgets and decide which areas of your party need more finances or are going over your larger budget. Keep a schedule of events handy for you soiree. The template not only budgets and has a guest planner but can help you schedule the order of events for your party. After entering the above information, view a “thumbnail sketch” of your upcoming party in a succinct table format.